I absolutely adore this dress. I originally bought it for a school event last May, and wore it that once, but haven’t pulled it out of my closet since! I love that the vertical stripes are a nice change of pace from the ever present nautical horizontal stripe! We’ve decided to name our link-up “Spotlight Weekly” to ‘spotlight’ some of our favorite trends/styles as well as some of our favorite bloggers (a few of them might be teachers too! 😉 ). We would LOVE to have you link-up. 2. Use the button provided on Elle or Jacqueline’s sidebar, or link back to the link-up on your blog. Lastly, remember that even though our theme is stripes this week, we welcome ALL fashion-related posts on this link-up! 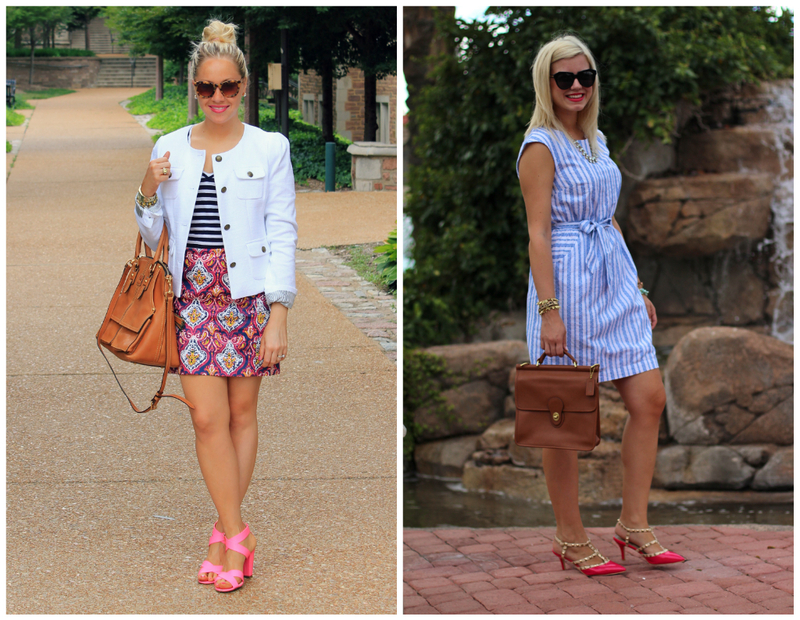 This week’s Spotlight is Tara from Mix & Match Fashion! 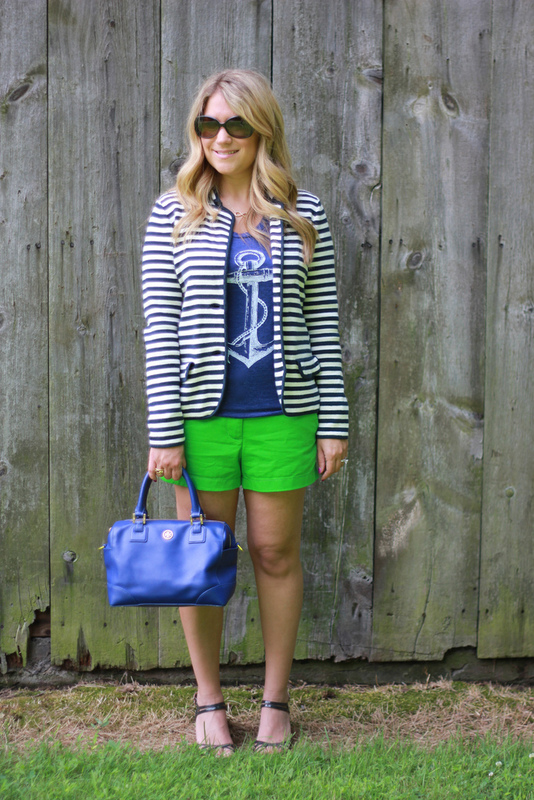 Tara is a fellow teacher/blogger and Jacqueline and I both love how she styled this striped blazer with those pop of neon shorts! NEXT WEEK: Next week our Spotlight Weekly theme is… SUMMER DRESSES! See you next Thursday 🙂 Thank you so much for reading, and for linking up! Such a stylish outfit! Great bag and shoes! I have this dress too! It's so comfortable and summery! Love how you styled it with the pop of pink! I can't believe that dress is from Target! It looks way more expensive than that. Love joining new link ups! Such a gorgeous dress–I love the color of the stripes! Great dress! Perfect for summer. Also, your shoes are amaaaaazing. Love that dress! This link-up is great. I just added mine and love following along. p.s.. I'd love to edit my name to include my blog. Can I do that? Both pairs of shoes in this post are EPIC. Where are the pink ones from? Love that dress! I saw it at Target when it first came out, but it sold super quick! Love it with the pink shoes- pink and blue is one of my favorite combos. Excited to link up! I love, love, love this dress! So light and summery, and blue and white is one of my favorite color combinations. I recently purchased a similar one from Gap, and it has been perfect to walk around London in this heatwave! I love all these outfit! Your shoes are so cute! I love the pop of pink. Nice and lovely outfit! Sandals are amazing and colour touch. Darling dress! Love the way you styled everything here and your sandals are perfect with the stripes. The stripes on that dress are refreshing and I love the clean look of the dress overall, especially the flattering corners on the hip area. What a great lip shade too! Love these shoes! They remind me so much of the valentino heels, except these are at a normal price (phew). This outfit looks fabulous on you! I love the dress! It's very French countryside-feeling!